Katti Renik (left) and fellow BSU Biology grad student Steve Hauschildt. 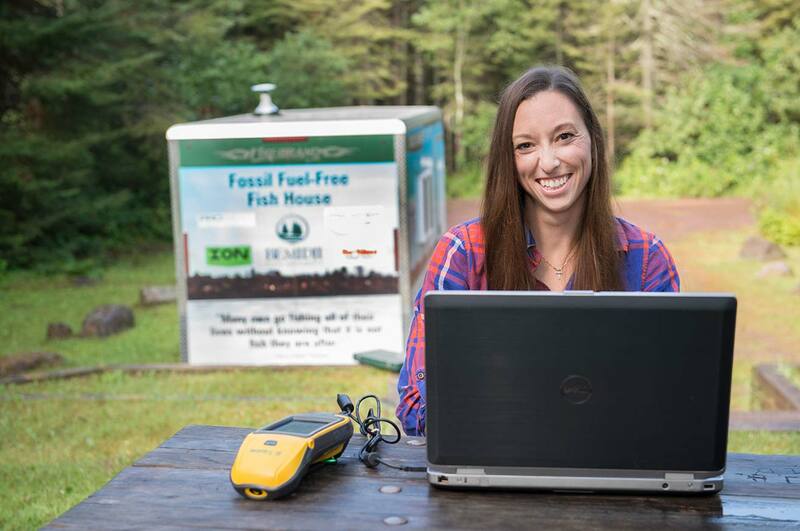 Katti Renik used BSU’s Fossil Fuel Free Fish House as a base camp during her research this summer. Katti Renik (left) and BSU biology grad student Steve Hauschildt. 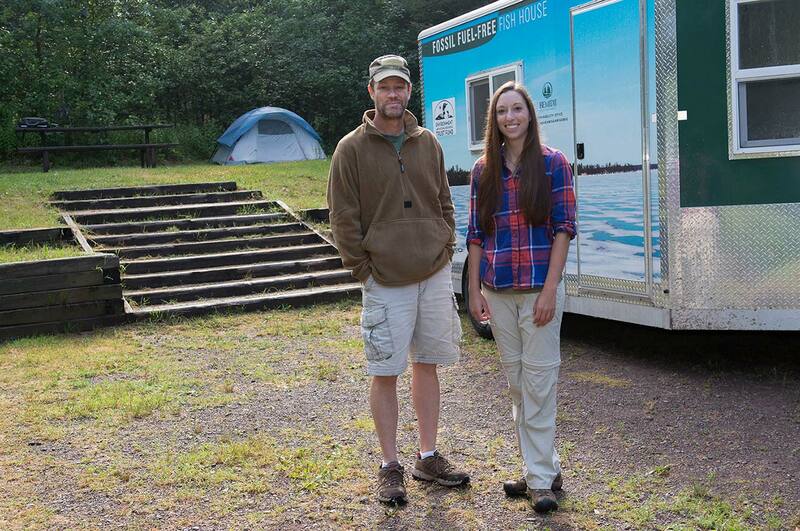 Katti Renik (right) and BSU biology grad student Steve Hauschildt. 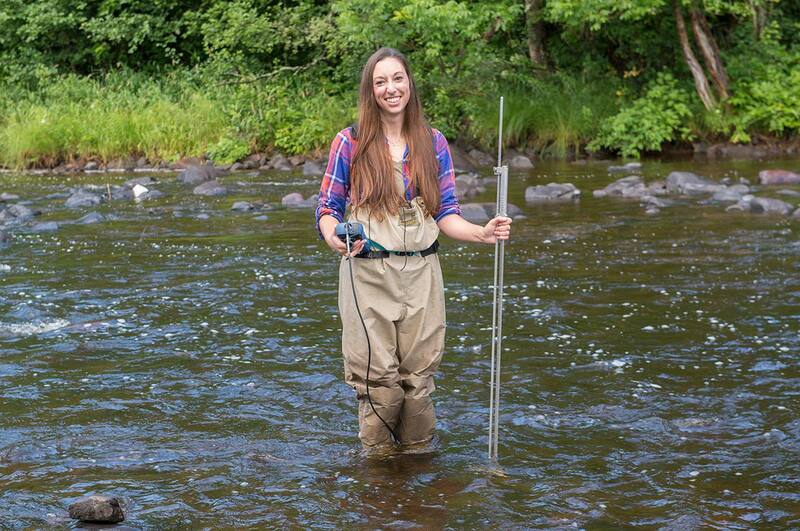 A Bemidji State University graduate student spent her summer researching the relationship between beaver habitats and brook trout across Lake Superior’s North Shore region. 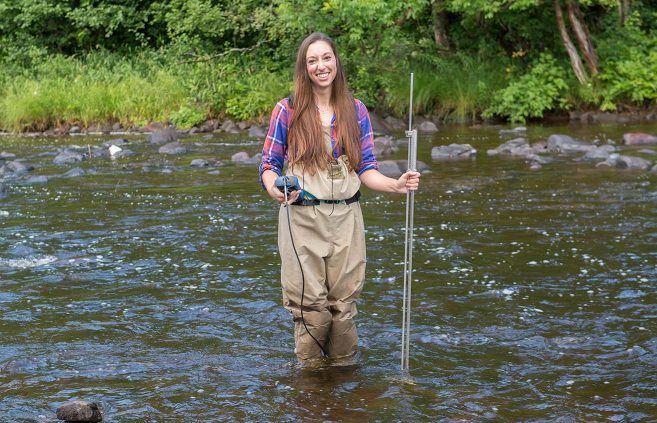 Kathryn Renik earned an undergraduate degree in wildlife and fisheries biology and management at the University of Wyoming before coming to BSU for graduate school. 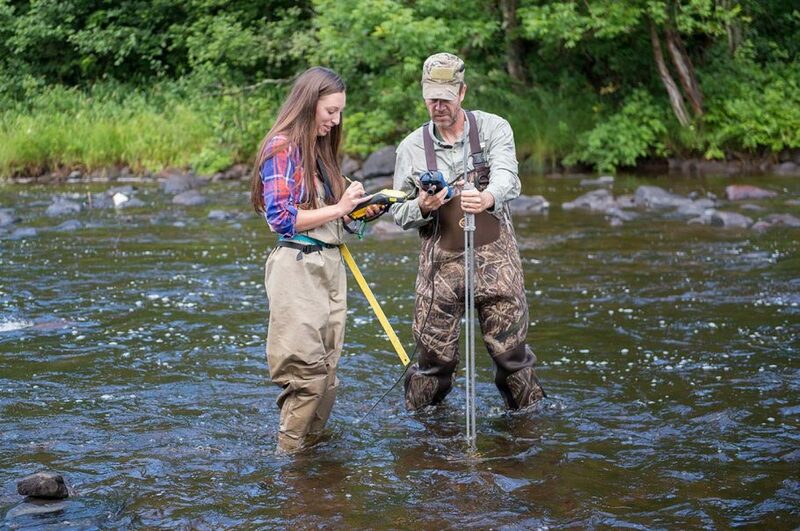 Kathryn Renik and research assistant Kylie St. Peter, a senior aquatic biology major from Bemidji, analyzed 30 streams and 10 beaver habitats to kick off a two-year cooperative project between Bemidji State and the University of Minnesota Duluth. 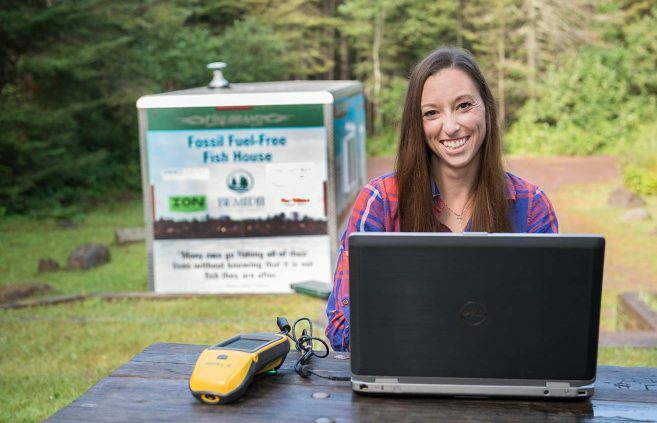 The project is funded by a $225,000 grant from the Legislative-Citizen Commission on Minnesota Resources, and Renik will return to complete her research next summer. Renik, a biology major from Bridgeport, Neb., said that in the western part of the country, beaver activity tends to favor positive habitats for brook trout — a situation that tends to be reversed in eastern states. 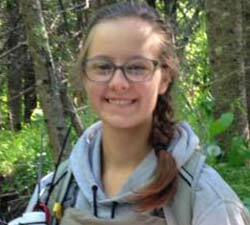 But she says little research has been done on this relationship along the North Shore. “A lot of people go up there to fish, and there’s concern that beaver are deteriorating the habitat,” she said of the region. “A lot of literature says beaver dams warm temperatures too much for brook trout, which like cooler water. Also, trout need a gravely substrate to spawn, and areas with beaver dams tend to have a lot of silt. There are also theories that dams might be a barrier to movement; there might be good habitat upstream that trout can’t get to. 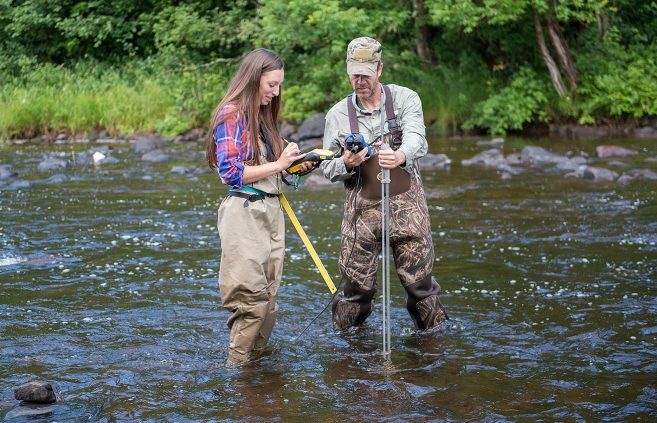 Dr. Andy Hafs, associate professor of biology at Bemidji State and a renowned brook trout specialist, became involved in the project in partnership with Dr. Steve Windels, research associate at the University of Minnesota Duluth’s Natural Resources Research Institute. 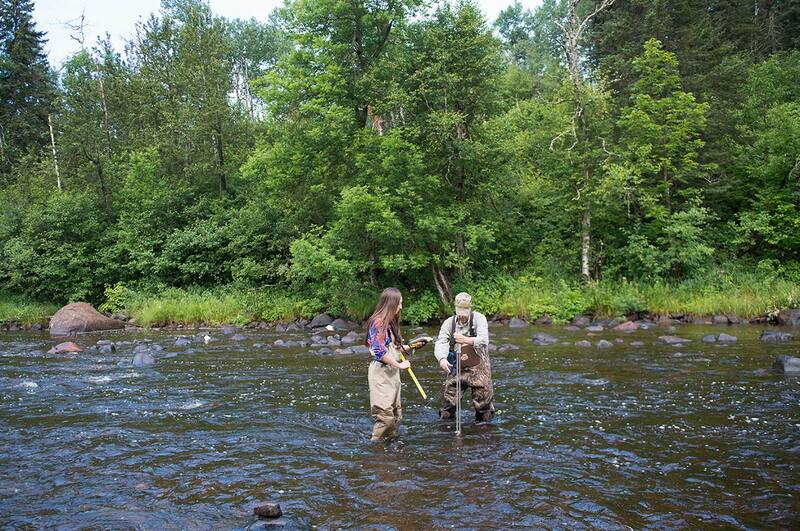 Hafs said that while similar research has been done in other parts of the country, little hard data exists for the unique ecosystems found in north shore habitats which feature cooler rivers and bedrock that lies closer to the surface. “It’s a a unique ecosystem up there that we need to find more information about,” he said. 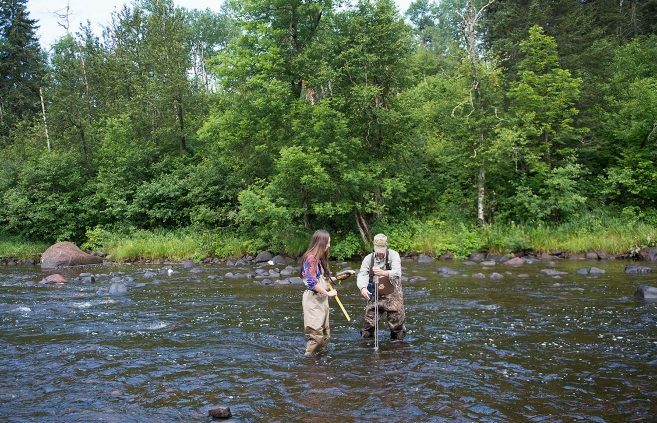 Renik and St. Peter analyzed a 150-mile stretch of land between Miller Creek near the Duluth, Minn., airport to a spot within about five miles of the Canadian border. 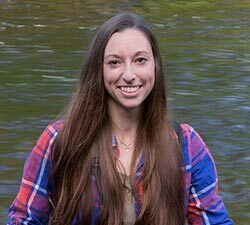 The data from her research, which will be completed next summer, will complement work being overseen by Windels at UMD to determine how beaver populations in the region have changed over time. 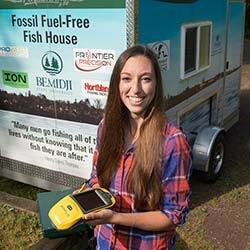 Renik used BSU’s Fossil Fuel-Free Fish House as a base camp during her seven weeks in the field. Hafs said the project aims to ensure that the DNR’s beaver management programs are only applied in situations where the outcome helps trout. “In cases where beaver removal hurts trout, this is a lose-lose situation for Minnesotans — because we also lose wildlife habitat creation, water filtration, recreational trapping opportunities, climate change mitigation and other positive benefits of beavers,” he said. Hafs and Renik both believe the research done this summer has the project off to a successful start. Bemidji State University, located amid the lakes and forests of northern Minnesota, occupies a wooded campus along the shore of Lake Bemidji. Enrolling more than 5,100 students, Bemidji State offers more than 80 undergraduate majors and eight graduate degrees encompassing arts, sciences and select professional programs. BSU is a member of the Minnesota State system of colleges and universities and has a faculty and staff of more than 550. The university’s Shared Fundamental Values include environmental stewardship, civic engagement and international andmulticultural understanding.